They always say “New Year, New Beginnings “don’t they? 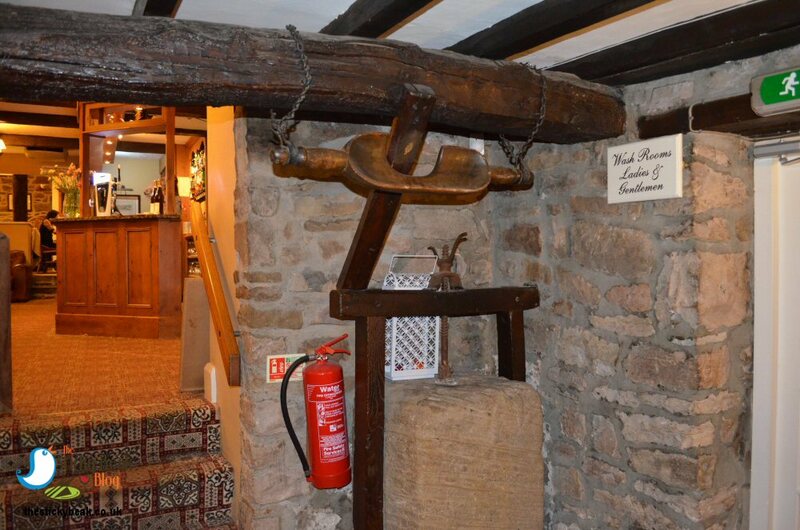 Clearly this was the case for the Brough family, who took over the Plough Inn at Brackenfield at the end of January (2018).The Plough Inn itself dates from the 16th century, and was originally a farmhouse; it is now a listed building, and when you go inside you are met with an abundance of original features. 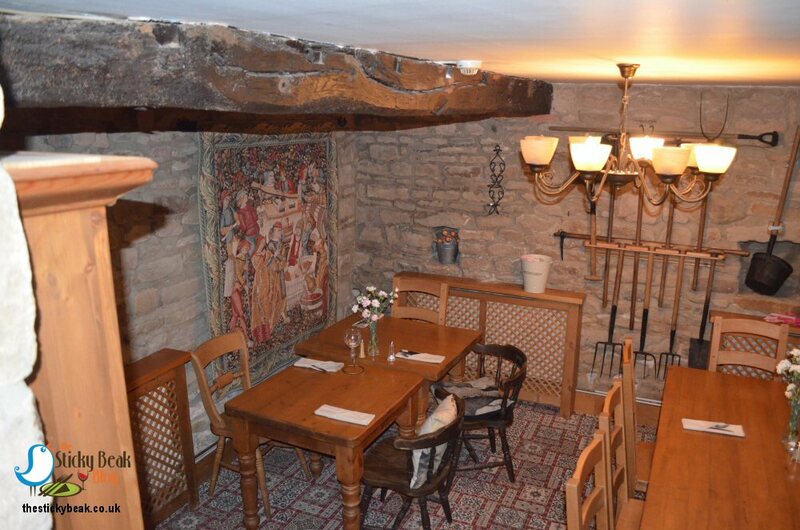 For a start there are the hefty (probably) Oak ceiling beams with their natural crookedness to admire, as well as the stone walls. 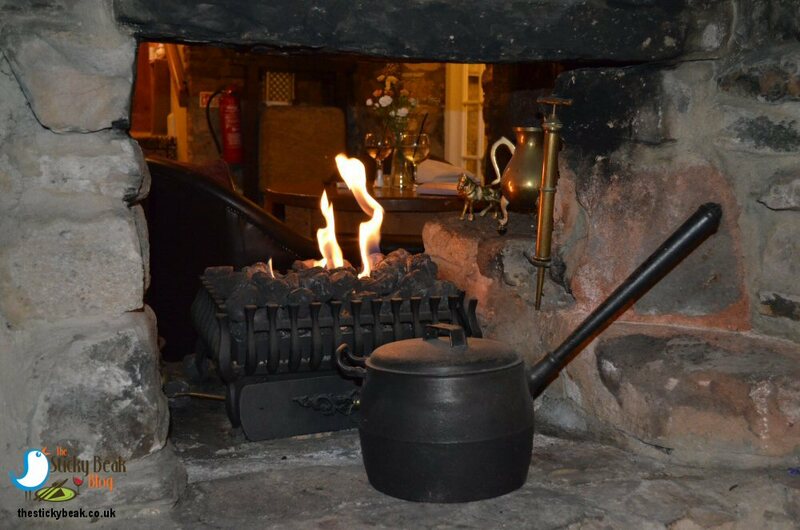 We sat down near the fireplace and sat beside a solid stone trough that probably had a host of uses, including washing the pots and bathing little ones. In the upper area, there is the bar and also several tables set for dining; another little area past the bar also has tables set for diners. A burgundy, cream, and sage axminster-type carpet is laid throughout, which pulls the areas together nicely. 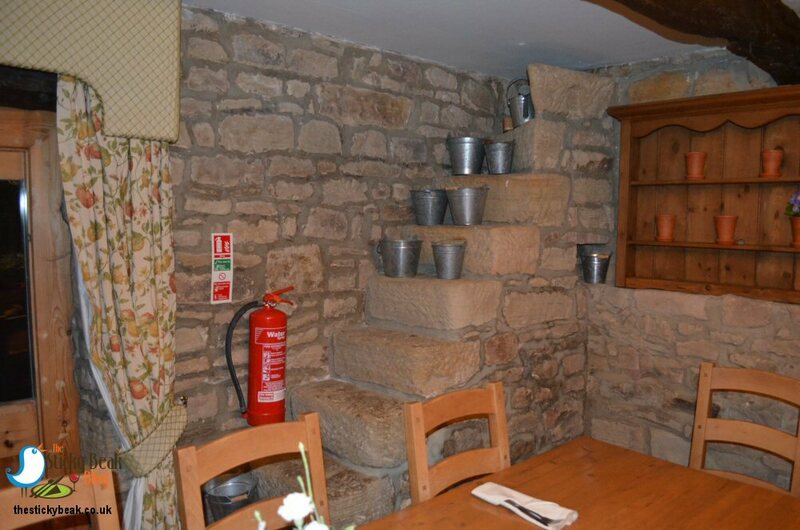 As we sat in our very comfy tub chairs we kept looking around and there were just more and more things to notice; the copper pots hanging above the fireplace, the milk churn in the corner, and the old fashioned hand plough behind my seat on a stone shelf. Children of all ages are more than welcome at this family run establishment, and there are several high chairs stacked up just waiting to be usedJ. There was a family dining when we came in but both boys were past high chair age! Other tables were taken by couples, and later on a group of friends came in to dine. 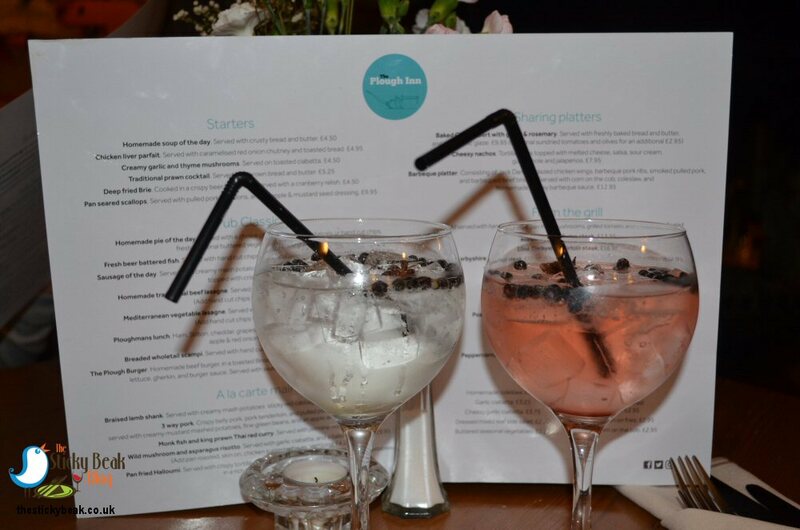 The Plough Inn has a Gin Menu that includes Gordon’s, Bombay, and Hendricks, as well as Elderflower- and Rhubarb- Gins. One of the family, Laurel, told us that she would love to expand the range, so we suggested she visit Rowley’s in Derby to sample a few tipples from their extensive range. For starters we ordered the Creamy Garlic and Thyme Mushrooms on toasted Ciabatta (me), and the deep fried Brie with Cranberry relish (The Man). Whilst we waited for them to arrive we sipped at our Gin and Tonics; they serve their Gins with Fever Tree tonics, in case you were wondering. After only a short while our starters arrived and we tucked in. A large bed of mixed leaves provided a great platform on which the cheese rested and also gave a great crunch in the mouth. 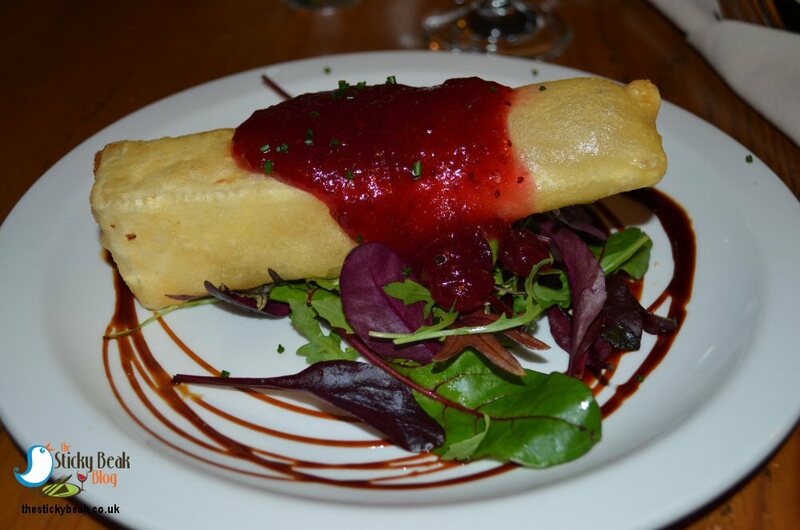 The Cranberry relish was wonderfully fruity with a lovely tang and richness to it; this contrasted nicely with the smooth creaminess of the Brie. 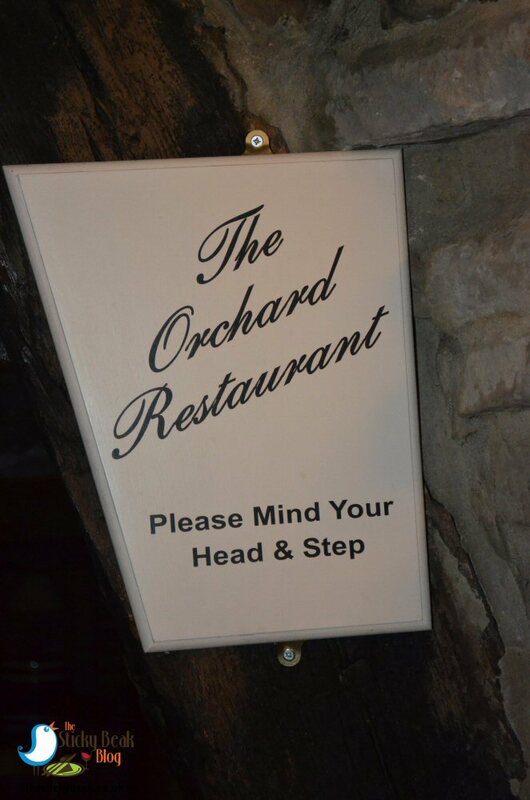 Sometimes the best laid plans go slightly skewiff and so it happened to be the case with The Man Birds’ choice of main. He’d planned to try the sausage of the day (Lincolnshire, on this particular occasion), but whilst we’d been yapping to the lovely Laurel, someone had ordered the last portion of it. Chef very kindly said that he would cook the remaining sausage for His Nibs to sample though, which was very kind of him we thought. 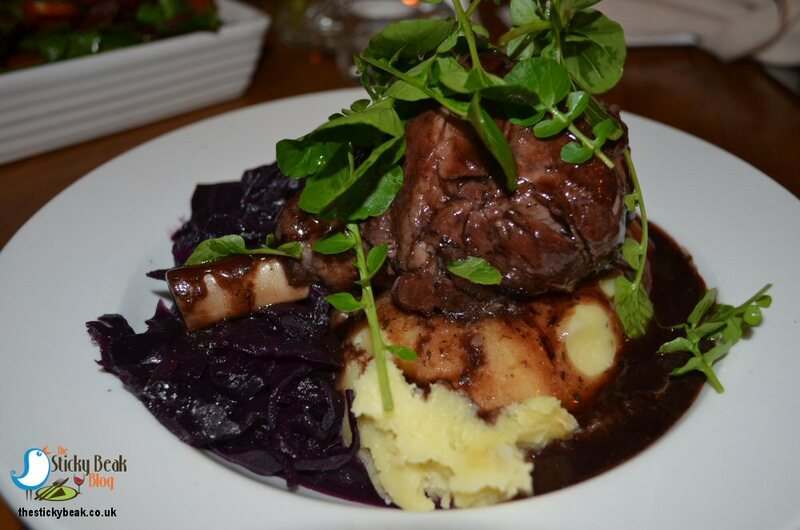 The braised Lamb Shank with creamy mash, sticky red Cabbage and minted Red wine jus was duly ordered instead, and I ordered the Wild Mushroom and Asparagus Risotto. I added on a chicken breast to this, and also ordered a mixed side salad. The Risotto was utterly superb; the rice had just a hint of bite left to it and its signature creamy flavour was fantastic. What I really liked though (apart from the fact that it was piping hot) was the fact that both the Mushroom and Asparagus were in abundance throughout the rice. 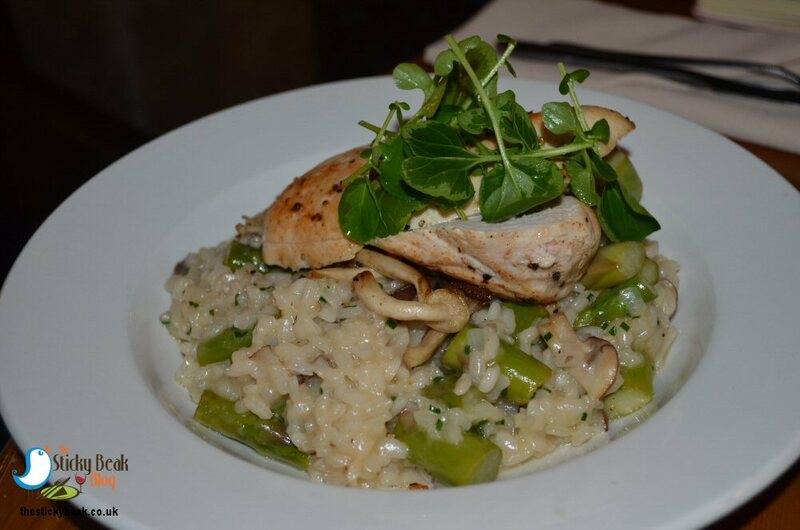 A lovely moist chicken breast had been sliced in two diagonally and carefully placed on the top of the risotto, and this tasted wonderful too. 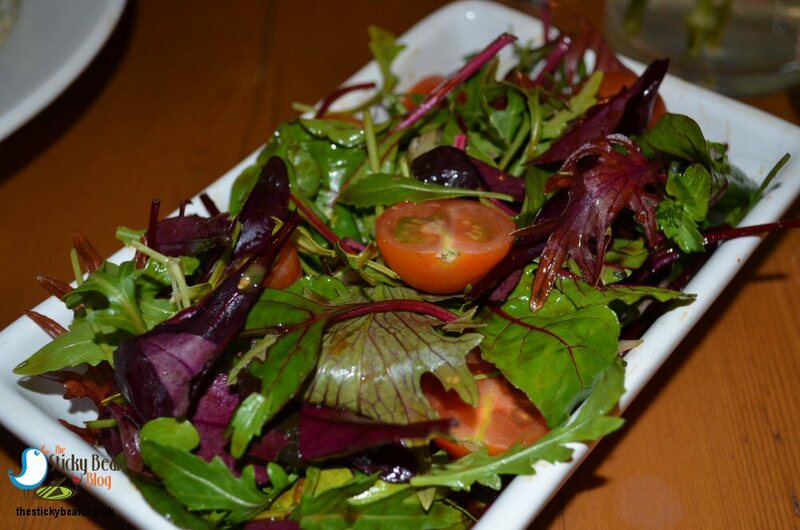 My salad comprised mixed leaves, cherry Tomato halves, sliced Red Onion, and Cucumber; all of which had been lightly dressed so that they had a beautiful glossiness to them. Our bellies were stretched at this point, but with the food having been so good there was no way we weren’t going to go the extra mile and have pudding! 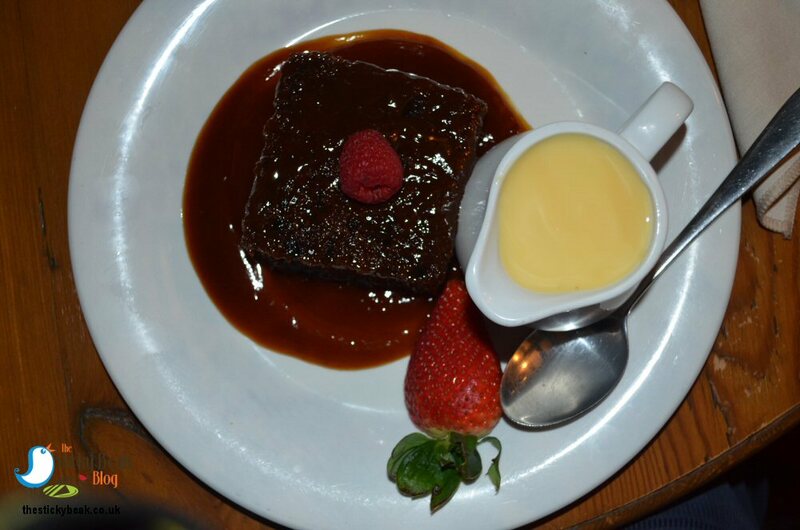 All the puds are homemade by the Chefs at The Plough Inn and, believe me, you really can tell that they are. 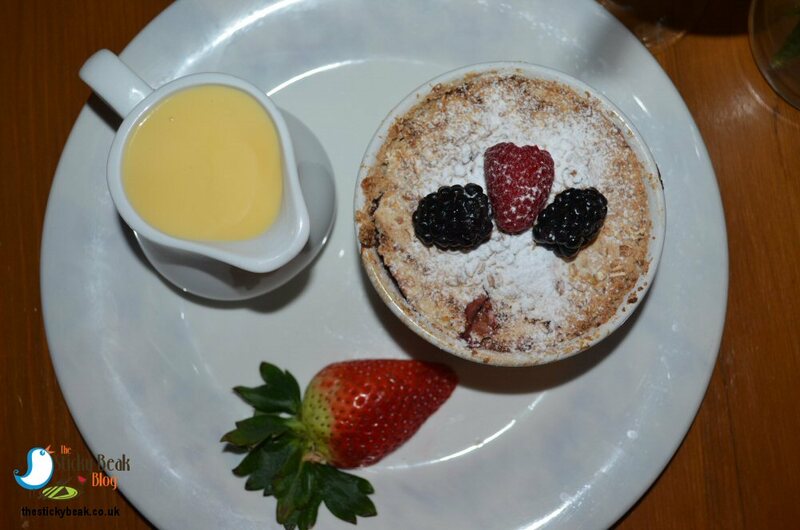 I chose the Apple and Blackberry Crumble with custard for my pudding; His Nibs fancied the Sticky Toffee pudding, again with custard. Now as you know dear reader, my Man is somewhat of a connoisseur of Sticky Toffee Puds, so I was curious as to what verdict he would deliver. When our desserts arrived there was very little ceremony or preamble involved; we dived straight in. The Boy Wonder was instantly won over by his pud-it was light in texture, yet exceptionally rich in taste; the perfect combination. I had a dib into the toffee sauce and I have to say it was just like homemade molten toffee; in my opinion this needs bottling and selling as a take home product! It was a cracking example of a soul-satisfying, indulgent pud and got two thumbs up from His Nibs :) Also worth a mention was the custard that was in a separate little jug on the side; red-hot, creamy, and plentiful-it was the ideal companion to the pudding. My crumble came in an individual round dish and the deep crumble topping had got oats within it, so it was more substantial than a lot of ones on offer at other places. What I really liked was the fact that as deep as the crumble layer was, it was matched by a deeper layer of Apple slices and Blackberries; you got the flavour of both elements in the mouth. Huge clouds of steam billowed out as I broke through the top layer, making way for the custard that I poured over the whole thing :) Fresh Raspberries and Blackberries adorned the top of my crumble, so it was nicely presented. I could happily have whistled for the services of my DeLorean and re-eaten the entire meal again; it was fabulous from start to finish, and the team were all so attentive and friendly throughout the evening. We settled for a couple of black coffees in the absence of said time travelling automobile, and spent a happy period mulling over the experience. If you have someone who isn’t such a lover of steaks, don’t panic; there is Gammon, Pork T-Bone steaks, Cumberland sausage rings, and a steak beef burger to choose from too. 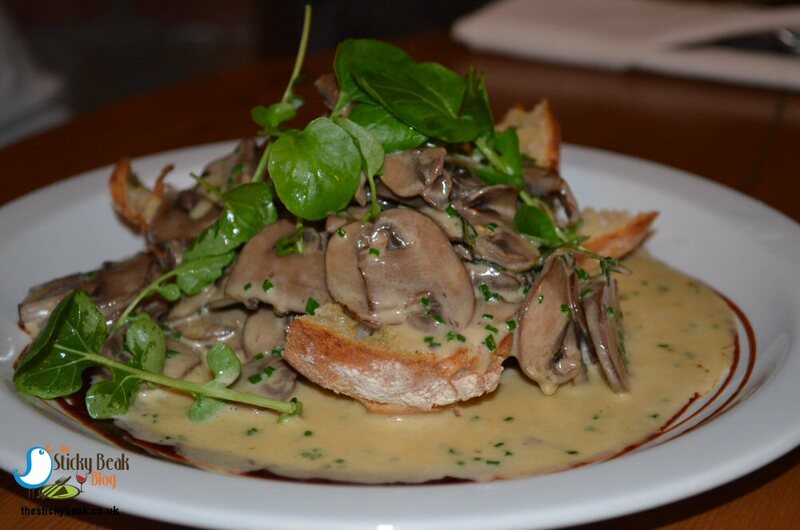 All meals on this night are served with hand cut chips, and peas or mixed salad; steaks additionally come with mushrooms and grilled Tomato. 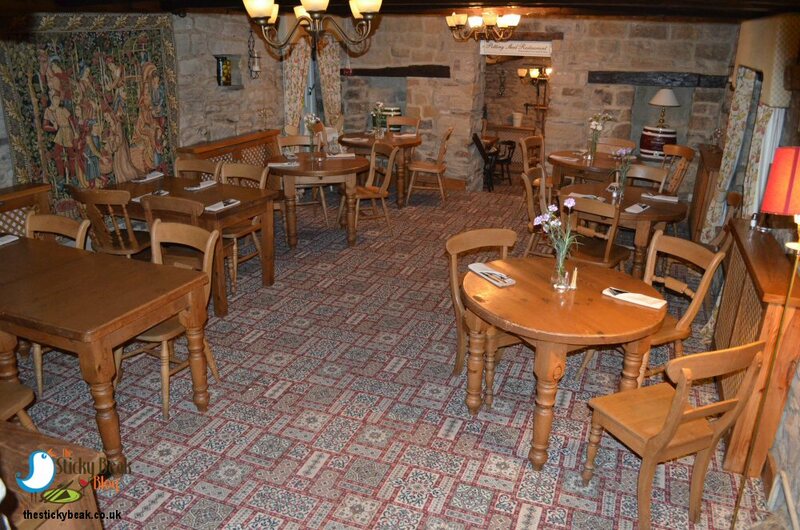 As well as evening meals, the Plough Inn also serves a selection of sandwiches up until 5pm; perfect if you’ve been Matlock or Bakewell way and are coming home along the A615. 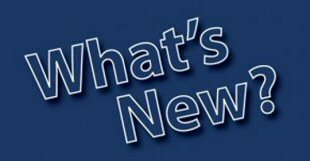 Tuesday-Saturday the Plough Inn is open 11.30am-11pm (food served until 9pm), Sundays Noon-10.30pm (food until 7.30pm), and it’s closed on Mondays – except Bank Holidays.